You’ll find information about upcoming and past performances and events on this page. If you’d like to be notified of the occasional special bit of news please join my mailing list (over there in the right column). 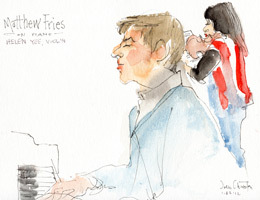 Playing jazz standards in a wonderful UES brownstone dedicated to illustration arts -- jazz, live models, artists busy at their sketch pads, and drinks and snacks at the bar. Playing originals and standards with the eclectic and adventurous string trio. Great atmosphere and drink, no cover. Music dating from ancient Han and Tang dynasties to the music of today is presented in an eclectic collection of songs in classical and folk traditions, and in contemporary setting. A multimedia theatre performance devised by a group of international artists, The Fall examines the world's relationship to the fall of the Berlin Wall and the end of the Cold War. Playing originals and standards with the eclectic and adventurous string trio (featuring Leanne Darling on viola, Loren Dempster on cello, and Helen Yee on violin). Great atmosphere and drink, no cover. Please enter your info below. You will receive an email from MailChimp to confirm you are a real person and that you are signing up for my newsletter. You'll have to hit "confirm" in that email to complete your subscription! 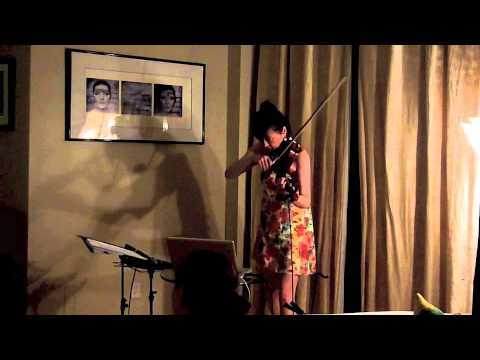 A house-concert performance of solo violin, looper and effects. An improvised duet performance that combines music, movement and text. A few excerpts from our recent "formal" performance at Linger Cafe.